Bon Jovi has always been a divisive band, especially amongst many of the readers of this site. Fans of 80's hard rock tend to have a spot for this band, while many have no tolerance for this band at all. With certainty, Lost Highways will provide more fodder for those who detest the band, and will also serve to divide true fans of the band. Have A Nice Day seemed to please most new and old fans of the band, even if it isn't a rehash of 80's glory days of the band. 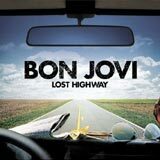 However, Lost Highways is an album that will definitely win over some fans, and possibly anger many. Lost Highways was recorded in Nashville. The decision to do this came after the remake of Who Said You Can't Go Home was re-recorded as a duet with a female country vocalist. Well, that song produced a Grammy, which undoubtedly got Jon Bon Jovi thinking about a whole new audience he could reach. With that, Jon and the guys packed their bags, headed to Nashville, and recorded the very country flavored Lost Highways album. Yes, I said country. Take the modernized hard rock sound of Bounce and Have A Nice Day and add slide guitars, acoustic country guitar / banjo pieces, and a slight twang to Bon Jovi's voice. Unfortunately, there are a number of flimsy, acoustic filler pieces that seriously drag down the album. Despite the number of filler tracks on the album, there are plenty of highlights. The first six tracks of the album are the best of Bon Jovi's more recent modernized rock, with a country twist. You Want to Make a Memory is the first single of the album, a decent ballad. The remaining of the first six tracks are all upbeat, catchy hard rocking tracks that would fit nicely on Have a Nice Day, if you extract the country ingredients. Any Other Day is easily the best of the bunch, and my pick of the album. Seat Next to You, Everybody's Broken, and We Ain't Strangers No More suddenly grind the momentum of the album to a halt. All three are acoustic drivel that can best be described as filler. Bon Jovi is, of course, the king of cheesy, tear jerking ballads. I just don't see the point of including ballady songs on an album that aren't even of average quality for the band. The Last Night gets things back on track with a catchy, mid paced country rock track that seems to stay in my mind thanks to some catchy guitar work and a big chorus. For what it lacks in energy, it makes up for it with catchiness and emotion. One Step Closer floows, and it is another slow, lifeless song that just falls flat for me. I Love This Town is a hokey, country pop tune that has a nice charm to it. It's just a feel good song that works well in the context of this album. I could easily place this song on These Days, if the country influences were dropped. This is a great closer for the otherwise up and down album. All in all, I don't think this is a bad album at all. I think it certainly could have been better if the dead weight tracks were dropped. Who knows, maybe the band was trying to tap into the "sentimental" country ballad fan base with these tracks? Of the twelve tracks on this album, I have to skip four right off the bat. The remaining seven are worthwhile, as long as you can accept the country twist. Those of you who appreciate Bounce and Have A Nice Day and do not mind country rock will find the most to like on this album. Of course, if you want nothing to do with anything country, you'll probably want to skip this album. As I said, Lost Highways is sure to divide fans of the band's more recent work. I suspect the band will attract a few new fans to the fold as well. Obviously, the band is calculating that the number of new fans brought into the fold will outnumber those who give up on the band. With the exception of You Want to Make a Memory, I feel that the slower tracks on this album are all subpar. However, the band masterfully blends the country influences into the hard rocking sound of Have A Nice Day and Bounce on the other half of the album. The strength of those songs alone will be enough to keep me coming back to this album over time.